Just because you have a small backyard doesn’t mean your family can’t enjoy the fun and exercise provided by a swing set. In fact, if your yard is too small for other types of outdoor fun, like soccer or kickball, small swing sets are a great way to keep kids occupied and get them moving outside. Make the most of your backyard by adding some scaled-down playground equipment. Adding a swing set to your yard encourages kids to engage in active play, something every family should enjoy together daily. It saves parents the trouble of traveling to a park or playground every day, too. Play sets of any size attract other children; adding one to your yard is a great way to meet the neighbors. Having everyone play in your yard means you always know where your kids are, who they’re with and what they’re doing. Where to buy Small Swing Sets? You don’t need to build a towering play gym in your backyard in order for your kids to enjoy playing outside. There are many swing sets for small yards and/or designed for younger children that give kids plenty of opportunities for fun. One of the biggest advantages to buying a swing set or play structure from Amazon is that most qualify for free shipping so you won’t have to worry about fitting and lifting over-sized boxes into your vehicle. The smallest structure we found is a single swing set that measures 72 inches high x 71 inches wide x 61 inches deep and is available on Amazon.com. The Hedstrom 2-in-1 Swing is designed to grow with your child while requiring limited garden space. It comes with a toddler seat and a regular seat. The set easily converts from a toddler swing to a junior swing when the legs are extended to the full height of 72 inches. It’s a great option for occasional use in grandma’s garden or other backyards where space is at a premium. If you need something for multiple children to play on at once, we suggest the Gorilla Playsets Standing Swing Set. It comes with two swings and a trapeze with rings. It measures (84H x 144W x 108L). It is a wooden structure that has a no-frills design and is not something that looks like it should have its own zip code. If you are looking for a swing set designed for small or younger children, you have even more options. The two we will share with you seem to be the most popular and offer the most activities for small children and small spaces. The Little Tikes Clubhouse Swing Set is designed for children 2 to 6 years old and includes 2 swings, a climbing wall, rope ladder, large slide and a steering wheel. It measures 143.5L x 68D x 76H inches. The manufacturer clearly states that this outdoor play structure must be anchored before use but they include the anchors with the product. The Step2 Naturally Playful Playhouse Climber and Swing Extension is perhaps our favorite small swing set for pre-schoolers. It’s like getting two toys in one. A playhouse and a swing set. It measures 75 x 110 x 115 inches and is recommended for children 3-8 years old. A toddler seat would be the only extra item you might consider adding to this outdoor toy which would obviously extend the usefulness of this item. 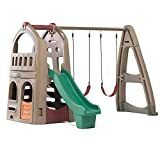 Reviews on several websites mentioned that the slide is longer and offers a better ride than that offered by some of the other similarly-sized play structures. It also comes with an anchoring system. 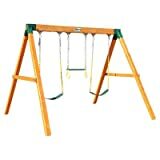 These are just a few of the options available for small swing sets that can be purchased from Amazon. They offer a wide variety of add-on items, like toddler swing seats, tire swing, additional safety hardware and just about everything else related to outdoor playsets. They also have the hardware and equipment to go back to basics by hanging a swing from a tree. Setting up small swing set isn’t much different than installing larger ones. Safety is every parent’s number one concern. Here are a few ways to be sure your little ones don’t get seriously injured while they play. Follow Directions: If there is some assembly required, be sure to follow the manufacturer’s directions to a tee or, better yet, go ahead and splurge for professional assembly where available. Safety: Swinging, by it’s very nature, constantly changes the weight distribution being held by the structure. If not included in your swingset, you should consider installing a tie-down or anchor system prior to allowing your little one to swing. Space: Leave plenty of space around the swing set so that high fliers don’t hit a tree, fence or other hard object. Also leave enough space for adults or older children to push the swingers without risk of being hit by the child they are pushing or other nearby swingers. Surface: Create a soft landing beneath small swing sets by clearing the areas beneath them of rocks or large tree roots and laying a soft surface. Mulch or recycled rubber works well. No matter how small your yard is or how young your child is, your family can have some big fun with small swing sets. Create memories, exercise little bodies and share playtime with friends when you install a backyard play set.